Ask jazz fans outside of New Orleans if they have heard of James Booker and most will lean back, rub their chin and say they know they have heard the name. Unless you lived in Europe in the seventies and eighties, where he was lovedor were lucky enough to hear him or play with him in his hometown of New Orleansthe name may not even be familiar. To those of us who did our laundry on Monday nights at the Maple Leaf Bar in New Orleans, where he had his regular gig, he was just a good pianist that kept us entertained while we drank our beer and waited for our clothes to dry in the small laundry in the back of the bar. We did not recognize just how good he was, and for that we should be forever sorry. Youth really is wasted on the young. 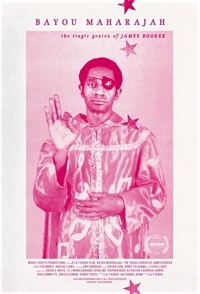 Booker was like no one else, and as Allen Toussaint says about him in the documentary Bayou Maharajah: The Tragic Genius of James Booker, produced and directed by Lily Keber, "I know the word genius is thrown around loosely, but Booker, I considered Booker a genius when I met him, and to this day, a true genius." It's always impressive when a genius calls another a genius, but that is what happens throughout the film. Keber's collection of concert videos, interviews with New Orleans musicians who played with him, audio and video interviews with Booker, and footage of old New Orleans bring Booker back to life again and introduce him to a new generation of fans. Booker, without a doubt, may have been the best pianist to ever come out of a city that already produced amazing piano players. Or, as Dr. Johnwho credits Booker with teaching him to play the organsaid, he was ..."the best black, gay, one-eyed, junkie piano genius New Orleans has ever produced." Keber's film allows Booker and the people who knew him to tell his story. She wisely stays out of the way; there was no need to interfere, as Booker and others unfold the story of what she rightfully calls his "tragic genius." And throughout the ninety-minute film there is a truly gripping and beautiful piano soundtrack playing in the background, and it is all Booker. The music speaks for itself and becomes its own character in the film. 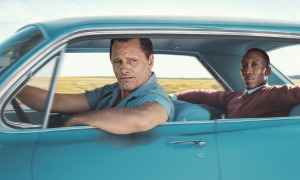 The film starts in his youth and, like many fine black musicians, he was influenced by his church and Baptist minister parents and grandparents, who played piano. He recorded his first song at the age of fifteen and went on to play with such greats as Ray Charles, Little Richard, Aretha Franklin, Fats Domino, Wilson Pickett, Irma Thomas and a host of others. He had a solo career playing all over the world and recorded over a dozen albums. Tragically, drugs took over his life, his mental health deteriorated, he did some jail time, and he died alone waiting for help at Charity Hospital at the age of 43. Another great artist taken too young. But he has fortunately left great works and stories that have been captured in this documentary. Several moments in the film are worth mentioning. Booker was a mentor and inspiration to a very young Harry Connick, Jr. and would often come to the Connick home to talk musicas well as law with Harry, Sr., who was the city's District Attorney at the time. In one scene, Connick decodes Booker's playing stylea left hand playing chords in a French-Chopin-esque style, with a right hand playing the melody in octave notes, chords in between with the three remaining fingers with added grace notes to give the sound an amazing fullness. Connick commented, "Nothing was harder than that. It's insane. It's insanity." But such an enjoyable insanity as Booker gets every inch of sound out of the piano. In another scene, those interviewed discuss how Booker lost his eye, which he covered with his signature star-adorned eye patch. Each person interviewed had a different story on how he lost his eye, ranging from an infection to a mob goon squad who pulled it out to settle a debt. Somehow, even Jacqueline Kennedy and Ringo Starr make their way into some of the stories. And the truth is, no one may ever know what happen to his eye, but the scene illustrates Booker's wild, flamboyant, storytelling nature. 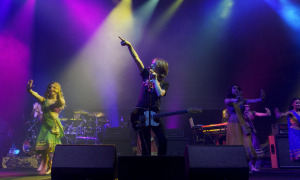 The film is filled with many rich moments of Booker's music. One of the most compelling is a scene with Booker playing "True," at the Montreux Jazz Festival. 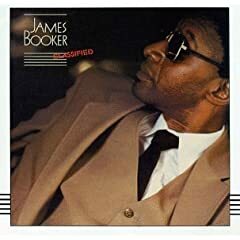 It is a soft song for Booker, but it illustrates well his exquisite playing and his nuanced, textured and expressive voice. Listening to the piece through to its very grand ending can bring one to tears at the passion and skill in which it was played.